Over the past year or two I’ve done a bunch of experiments with the Chemigram process and even combined it with the Lumen process. In the work so far I’ve used various different substances as resists to control the action of the developer and fixer on the paper, thus influencing the pattern of the light & dark regions. Meanwhile for film processing at home I have been using my Caffenol-C-H-UK recipe almost exclusively as the developer. Caffenol is not just for film, it can be used for developing paper too and it occurred to me one day that instead of mixing up the caffenol in a jug, it might be interesting to just let the caffenol ingredients mix and react directly on the paper. 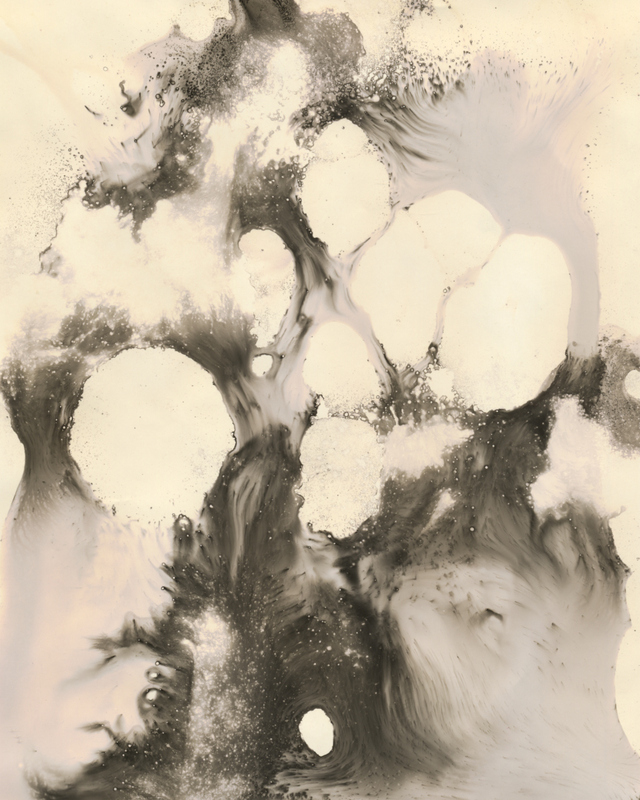 So began a new series of chemigram experiments without using any kind of resist at all. Caffenol is made by mixing washing soda crystals, vitamin C, instant coffee and optionally some iodized salt. The coffee and vitamin-C are the developing agents while the washing soda acts as an accelerator. The first step was to make a solution of washing soda and water and thoroughly soak the sheets of paper in it. 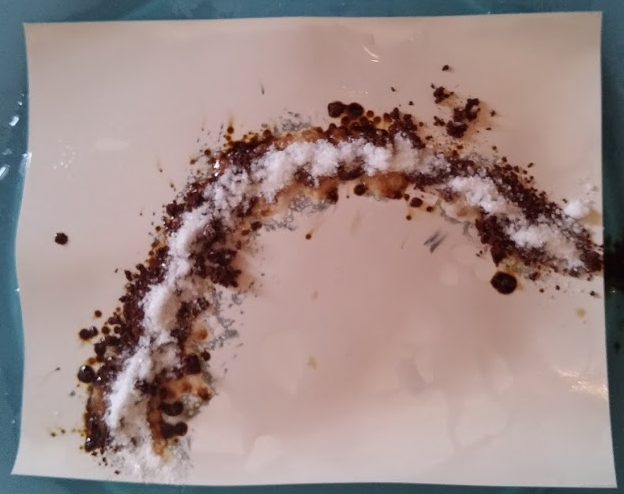 The granules of instant coffee can be placed individually on the paper where needed, or simply sprinkled in an adhoc manner. The vitamin-C powder can just be poured or sprinkled onto the paper. The theory is that when the coffee/vitamin-c hits the wet paper it reacts with the washing soda to form caffenol on the surface. 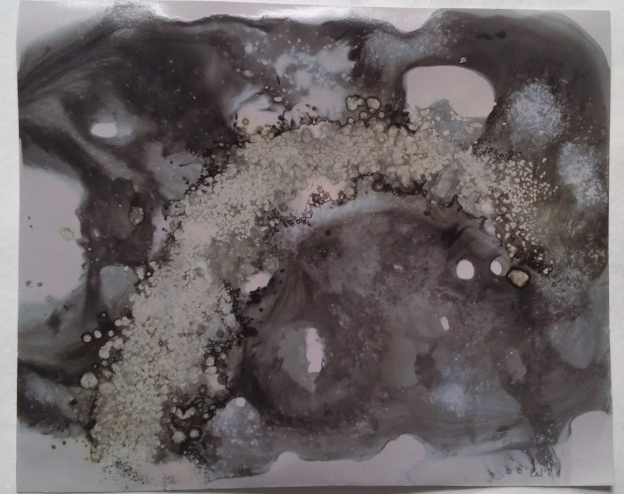 This is done in normal lighting conditions so the paper is universally and totally exposed and should gradually turn black where the caffenol has formed. The process was repeated, but without pouring washing soda over the ingredients, just relying in that initially absorbed by the paper. The results were fairly similar to the first test, but with less development of the surrounding paper, as would be expected due to lack of run-off. The results obtained were partially aligned with the initial expectations of the process but, as always when experimenting, there were surprises. In particular the inability of the paper to absorb sufficient washing soda solution was a key limiting factor in the results. It was surprising to see how the coffee + vitamin-C alone were fairly weak, but when they combined they became stronger than the sum of the parts. 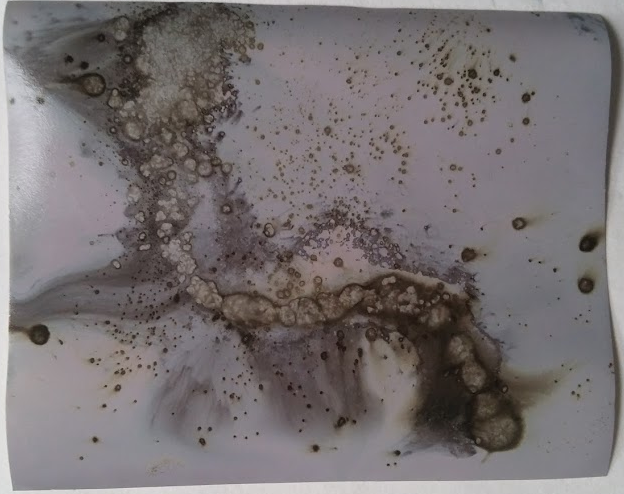 Finally the way the coffee became a sticky mass on the surface of the paper actually caused it to act as a chemigram resist, as well as a developer at the same time! With the second print the aim to was make a very dynamic image showing the motion of developing liquid on the surface of the paper, at the expense of any fine detail. 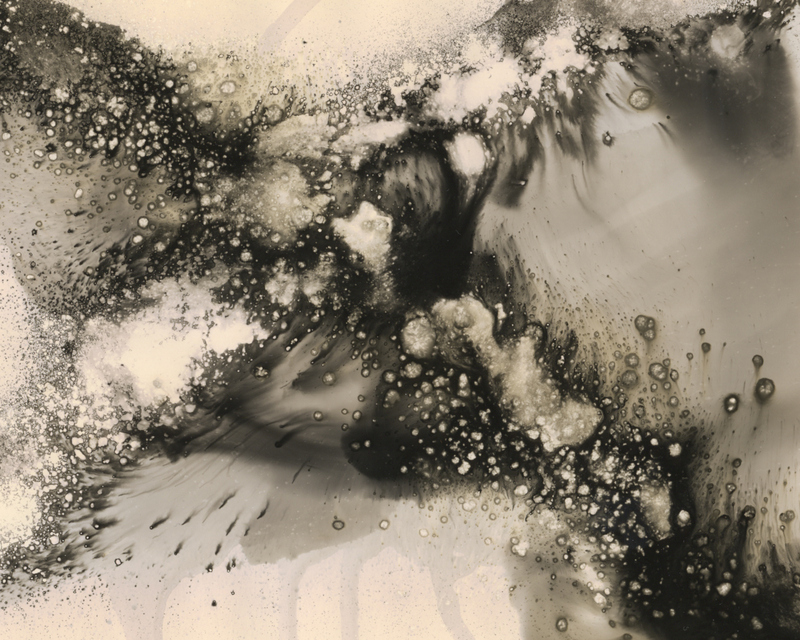 Pleased with the results of caffenol in a pure chemigram process, I decided to take it a step further and try to combine chemigram with a traditional B&W development process in the darkroom. A while ago I took an simple photo of the Moon with a DSLR and teleconvertors which I then used to create a digital negative on acetate for printing as a cyanotype. Astrophotography is an increasingly popular endeavour for many people, but almost without exception the aim is to produce images with the best sharpness and finest detail the equipment will allow. An unfortunate result is that any two images of the moon will look broadly alike, and my own astrophotography images of the moon are no exception. So I decided that this digitally captured moon image would provide a good challenge as source material for creating a truly unique photographic print. In the darkroom under safe light conditions, I placed a sheet of outdated Ilford FB 8×10 paper under the enlarger. The digital negative went on top of the paper for purpose of contact printing. From previous experience contact printing on this paper I just guesstimated the exposure at 15 seconds, with lens at f/8. The paper now has an invisible latent image ready to be worked on by the caffenol. 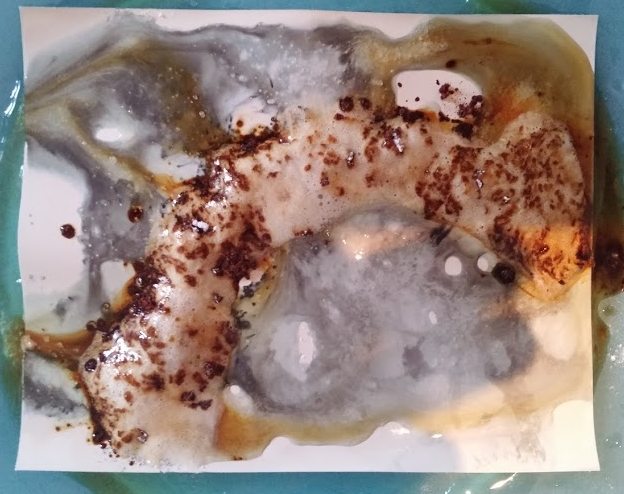 I soaked the paper in a washing soda solution, randomly sprinkled instant coffee and vitamin-C onto the paper and then just let it sit for a few minutes to give time for the caffenol to start working. Part way through I also added a very small amount more washing soda in some areas to encourage the development. After approximately 3-4 minutes (I wasn’t really timing this) I could see slight hints of the paper starting to turn gray in places. Washing off the caffenol residue though showed almost no development across most of the paper, which was initially disappointing. None the less I now put the print through a regular B&W dev, stop & fix process. Rather than leaving it in the developer for the full 1 minute though, I noticed it was developing quite fast and choose to just move it to the stop bath when it “looked about right” – about 35 seconds. What was happening was that although not really visible yet, the caffenol had indeed kickstarted the development across the paper and the normal developer was just needing to finish off the process. If I had let the image site in the developer for the full 1 minute it would have been over developed and lost some of the qualities of the caffenol granulation. 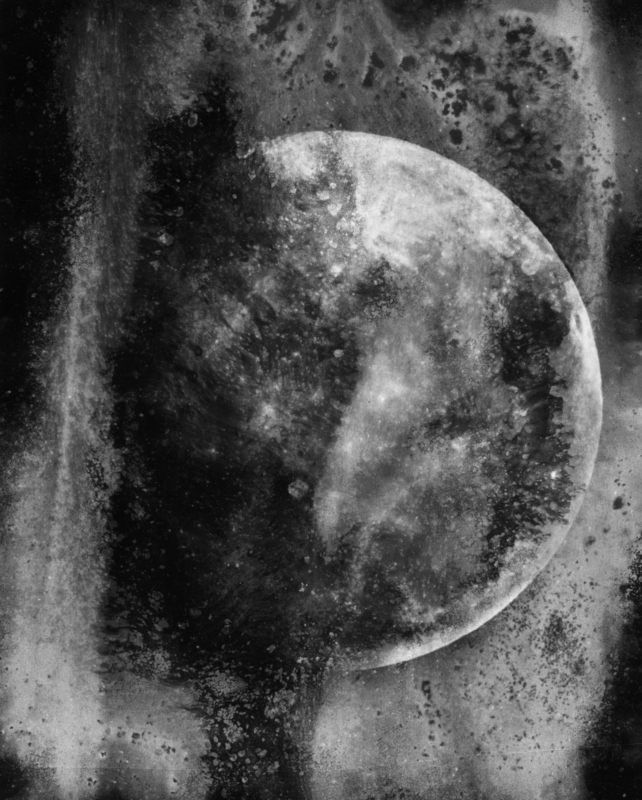 This entry was posted in Photographic Processes, Tutorials and tagged caffenol, chemigram, contact print, darkroom, moon on March 22, 2016 by admin.